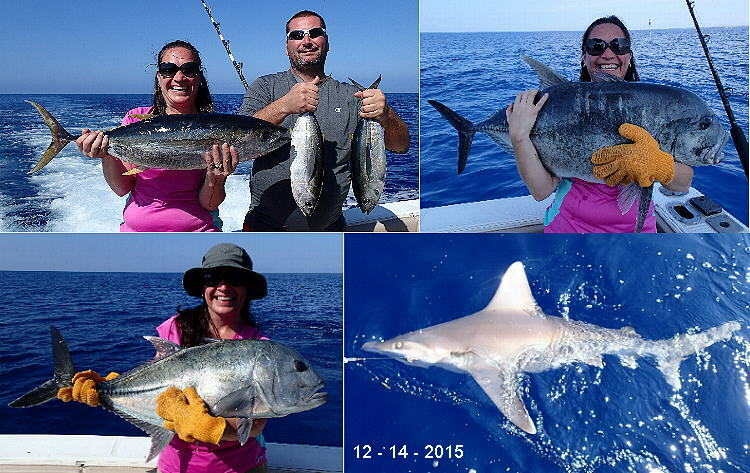 Kona Hawaii Fishing Report – December and year end wrap-up. Happy New Year! 2015 flew by pretty fast. Doing a quick glance over my catches for the year, I have to say that it’s a good thing that Hawaii has the FAD program. Fish Aggregation Device’s kept me catching food fish on pretty much every trip. The “Farm Buoy” although not intended as a FAD certainly is one and so is “The Pipe”. Some of the FAD’s around the West side of the Big Island have been missing for years and funds were finally released to get those replaced. Just in time too! We just lost two more FAD’s this month. OT buoy and B buoy are gone. Both of those buoys are very important to the local sustenance and commercial fishermen and the State knows it so they will be replaced soon. The striped marlin bite remained pretty good this month and it’s just the start of the season for them. The next few months are the peak part of the striped marlin run. The orange striped marlin meat is gaining in notoriety as some of the best sashimi you can get. I’ve been writing about it for years now and it’s finally hit the main stream for sashimi enthusiasts. I liken it to when opah wasn’t even a saleable fish because no one knew about it and once word got out about how good it was, it quickly elevated to one of the most expensive fish on the market. Orange striped marlin meat could easily be elevated to a delicacy. The blue marlin bite was pretty good for December too even though it’s the slowest part of the season for them. The spearfish bite is really turning on. The peak season for them is February through April but one thing I’ve always said, fish don’t know how to read calendars so we’ll have to wait and see what happens to the billfish bite this winter. The mahi mahi bite was good this month. Normally it starts slowing down by this time of year but with the “Godzilla” El Nino, the water temp is still kind of high so we could possibly be seeing a good mahi mahi bite all winter. That would be nice and it wouldn’t be the first time that’s happened. The big ahi were scarce this month but the small ones on the FAD’s were a very consistent catch. I saw that there were some ono flags flying this month so even though it’s off season for them, there seems to be a few around. The giant trevally (GT) bite started late this year and I’m wondering if it will be a good season for them at all. I’m one of only a very few captains here that even targets GT. They are a sport fish more than an eating fish because of the possibility of getting ciguatoxin poisoning by eating one but if you’re looking for a challenging fight, GT are pound for pound one of the hardest fighting fish on the planet. Increasingly, sharks have become the most common bottom fishing catch over the years. There was a time when the amberjack, almaco jack and GT populations far outnumbered the shark population but seeing as sharks feed on amberjacks, almaco jacks and GT’s (and not the other way around), the sharks over time have won out as the dominating fish on the bottom fishing grounds. Years ago, especially in December, it was a common sight to see 30 to 50 boats on the bottom fishing grounds fishing for snapper. Now days it’s usually none or maybe one or two. The local population of snappers has been almost totally wiped out by the sharks, even if you do hook up a snapper, it’s likely to be eaten by a shark before you can get it in the boat. The jacks fair a little better only because of their size and mobility in comparison. It’s a shame that this change has happened over the years but it’s a change that you can’t blame over fishing by local fishermen for that change. For me as (mostly) a sport fisherman, the sharks provide a good fight and usually end up being the biggest fish my anglers have ever caught in their lives. I photo and release them. Could it be that I’m part of the problem for not killing them? I don’t think I want to inject myself as part of the problem or as part of the solution. I think I’ll just continue to let them go, let nature take its own course and have some fun fighting sharks while it lasts.